Screenshot via ABCKellyanne Conway, counselor to President Donald Trump, made the rounds on the Sunday political shows this week. Counselor to the president Kellyanne Conway took aim at Omarosa Manigault Newman’s credibility after the former White House aide’s tell-all memoir was announced this week. Conway told ABC’s “This Week” host Jon Karl Manigault had “undercut her credibility” and cast doubt on her claims that President Donald Trump is a racist. “Unhinged: An Insider’s Account of the Trump White House” reportedly contains a number of bombshell allegations against Trump from Manigault’s time in the West Wing, though some of them have been contradicted or mostly discredited. Counselor to the president Kellyanne Conway hit back at former White House aide Omarosa Manigault Newman‘s claims in her upcoming book as false ploys for publicity. “The first time I ever heard Omarosa suggest those awful things about this president are in this book,” Conway said, referencing reports Manigault Newman calls Trump “racist,” “misogynist,” and a “bigot” in the book. “And I think that Omarosa, unfortunately, has undercut her own credibility,” she added. 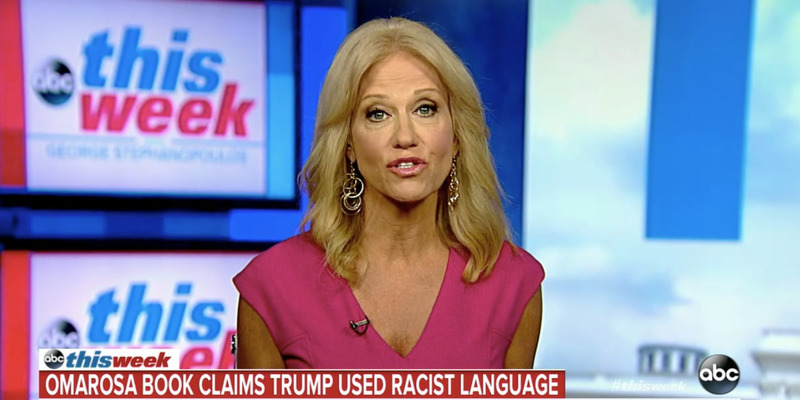 Conway referenced Manigault Newman’s past comments of glowing praise for Trump during her time in the administration, which she first joined in late 2016. Manigault Newman’s main accusation against Trump as a racist reportedly cites anonymous sources in claiming that Trump is on tape using the N-word while on the set of “The Apprentice,” on which she was a contestant in 2004. But she appeared to contradict that claim in an interview with NPR, where she said she had heard a recording of the comments herself. She reportedly writes in her book that she was informed by a source that Trump used a racial slur. Conway said Sunday she had never heard about the incident before now, ahead of the book’s release. The Guardian reported last week Manigault Newman claimed she personally witnessed Trump insulting Kellyanne’s husband George Conway’s Filipino heritage with racial slurs. “Would you look at this George Conway article?” she claims to have heard Trump say. “F—ing FLIP! Disloyal! F—ing Goo-goo.” George Conway, a lawyer, is a vocal critic of the Trump administration on Twitter and in articles he has written for Lawfare. Reports of the bombshell allegations in the book, including Trump apparently eating a piece of paper in the Oval Office, caught fire this week. Manigault Newman also wrote in the book she was offered $US15,000 a month contract to sign a nondisclosure agreement after she was fired from the White House last year, which she said she turned down. The White House spent the weekend hitting back at discussion of the allegations, with press secretary Sarah Sanders saying the book is “riddled with lies and false accusations” in a statement released Friday afternoon, and Trump calling Manigault Newman a “lowlife ” in front of reporters on Saturday.